Updated one bedroom. Sleeps for 4 (pull out queen sofa sleeper in the living room). Clean and accommodating for couples and small families. Fully furnished (including linens and bath towels). 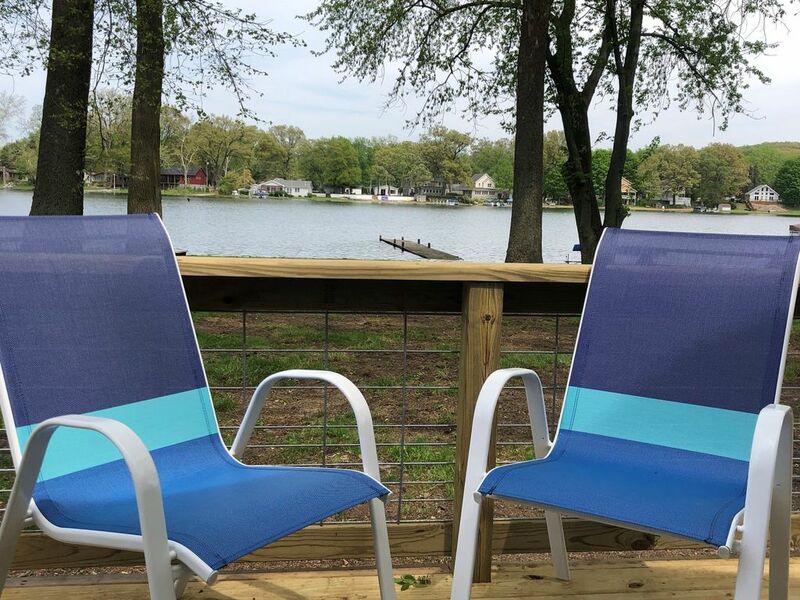 Enjoy the all-sport lake or just relax on the deck. Nestled in Southwest Michigan's fruit belt with plenty of area attractions to lure you if you can separate yourself from this cute lake shore cottage. We love this property with its small size, yet inviting layout AND of could say no to the lake. Being right on water is fantastic! Vacations here are simplified when your biggest plans are to just enjoy the lake, the cottage, and some time away from it all. Set 10 minutes from the nearest town. Enjoy a little bit of country while at the lake. All sport 65 acre lake. Great for swimming & fishing. Very cute, well kept, everything seems brand new inside! Adorable place with everything you need. The owners' communication was fantastic and we would recommend staying here. We loved this cute & tidy little cottage! Beautiful & peaceful setting on the lake. Almost everything in the cottage seemed new, from the floors to the bedding & furniture. It had everything we needed except for a corkscrew to open the wine we bought from the local wineries. We enjoyed our stay & would like to go back in the summer to fully take advantage of the lake. The owner communicated very well with us & even let us stay later than the normal checkout time. A Getaway So Special that I Would Prefer NOT to Write this Review! My spouse and I were looking for a simple, clean sanctuary away from Chicago, one that wasn’t too expensive or too long a drive. From the posted pictures, it looked like this little lakeshore home might be the answer, and indeed it was! From the pictures, you can tell that Sarah’s home is cozy and spare. What you can’t tell is that it is scrupulously clean, that is has pretty much everything you need for a comfortable weekend, and that even three days of rain will not keep you from enjoying lovely drives, delicious meals and the natural beauty that is Michigan. The furniture is comfortable and the appliances and electronics work very well. Since we are in the market for a sanctuary, we checked out everything! We were able to sit outside for a little while all three nights, and the day we left the weather cleared up (naturally!) so we were able to walk around the area and enjoy the water a bit. Sarah is very attentive to any questions and comments you might have about the property and the area in general. We will most definitely be back! I was in town for a business trip and prefer VRBO vs hotels. This is a great spot. Super clean and Sarah is extremely responsive and helpful. The fishing was great right off the dock and the ability to use the paddle boat was extremely helpful to get to those perfect spots to find the bass. I live in Michigan and would def bring my family back for a weekend get away. The lake is not crowded and very peaceful. A must stay at place whether you are passing through or looking for a peaceful retreat for the weekend. Thank you for sharing your space Sarah. I look forward to staying here soon. I was looking for a small, affordable house on a lake, tastefully decorated, and I found it! It was just the right size for the two of us, and we felt fortunate to have a deck, fire pit, dock, and kayaks. Spending a few lazy days floating and watching minnows and casually kayaking around the lake was just what we needed. The lake is quiet for the number of houses on it. The water is especially calm in the early morning. The Wi-Fi connection was solid. We found small bundles of firewood for sale right down the street. Picked up coffee and wine at the convenience store, made some simple meals in the kitchen, and went out twice - once for lunch at a bar in a historic building, and once for dinner at a stylish brewery with a lake view of the sunset. This cottage and small town make for a great retreat. Cute little cottage on peaceful twin lake. Had a great time despite not having the best weather. Cottage had everything we needed. Nice and clean! Would have to say the only thing that was a little bothersome was the coffeemaker and toaster’s electrical cords were too short to reach the outlets available. We actually went into town to buy an extension cord. Other than that everything was wonderful! Had a great fish dinner the last night from all the fish we caught right off the pier! Thank you Sarah for being so prompt in replying to any questions. We would definitely recommend this place. The nearest town is historic Dowagiac which is a 10 minute drive. Dowagiac has grocery stores, restaurants, a casino, and cute shops. If you have time and inclination to venture farther out (30 minute drive or less) you will find wineries, breweries, ice cream shops. Beautiful St. Joseph which is situated on a bluff overlooking Lake Michigan where you can shop, dine, play, or enjoy a terrific sunset from the sunset coast of our nearest Great Lake. There are also several marinas in the area to rent boats.